Eat up dry cross courses with the Piranha 2 Cyclocross Tire. With it's low profile center knobs and taller knobs on the shoulder, this tire is designed for fast rolling over dry ground while still providing confidant grip when cornering. 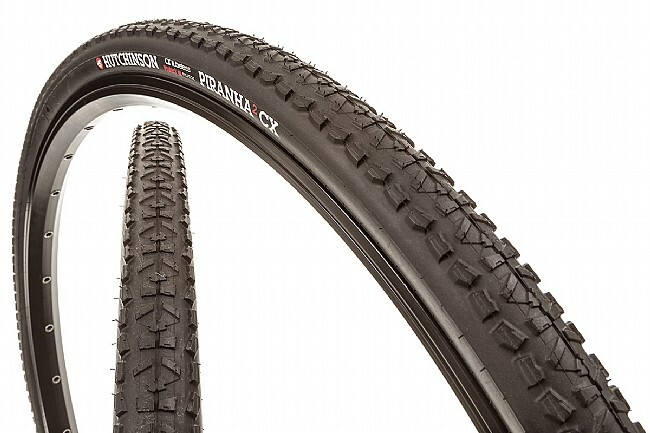 The Piranha 2 Cyclocross Tire is not tubeless-ready. Available in 700c x 32mm. 360 grams. If you are looking for the Tubeless-Ready version of the Piranha 2, you can find it here. I have raced on the Hutchinson Piranha's for 2 years. I have tried other tires and keep coming back to the Piranhas. Side note I only race in dry conditions. The raised tread on the sides helps a lot with cornering. Explosive!-but not in a good way. These are supposed to be a viable tubeless tire, but I've been unable to seat the beads with my rims (not a problem with other tubeless tires I've used.) Problem is, the tires blow off the rim at about 70 psi (the stated max is supposed to be 84 psi) and I can't get the bead to seal well at less pressure. When the tire blows off, it's a deafening explosion and sealant goes everywhere. It's happened twice to me and I've heard of it happening with this tire to others. So I've resigned to riding them with tubes. Riding them as a tubed tire with the recommended pressure of 43 psi is no good in rough terrain, as they easily pinch flat. So I ride them inflated harder, but I'm not getting any of the tubeless suppleness that I was looking for. Basically, the tires aren't working for me as I'd like them to. At least they were relatively inexpensive. These tires are a beast to put on but once you have them on you will be very pleased. And since there to bless and have sealant in them you won't have any flats and will not need to remove them until they're worn out. had a ruptured bead on a gravel road coming down a hill at Odins Revenge. Had a ruptured bead at Odins which knocked me out of the race. wouldn't hold a tube after that. Had about 60lbs in the tires which may have been too much. I weigh 203 and the bike about 20. Came down the hill at low speed. Apreciate you guys warrantying it out for me. was using stans and will use the Hutchison sealent as directed. will ride some more gravel soon.